On Tuesday, Amazon.com was granted a patent for Personalized Selection and Display of User-Supplied Content to Enhance Browsing of Electronic Catalogs, which the three inventors note covers authoring and posting pieces of content, referred to as 'blurbs,' for viewing and rating by other users. The patent claims cover blurbs generated using a blurb authoring pipeline ('internal blurbs') as well as those obtained from external sources via RSS feeds ('external blurbs')." The details show that the patent is for personalizing these "blurbs," but it's difficult to see what's patentable here. Reading through the claims, there doesn't seem to be anything that's new here. All it's really doing is creating personalized blogs based on a combination of external blog content, catalog content and user reviews. In other words, it's aggregating a personal feed of content from a variety of sources. There are plenty of solutions out there that do this already -- it's just that they don't all refer to the content as "blurbs" as Amazon does, and they don't make it as explicit that it will include catalog content. But, aggregating content in a personalized manner is aggregating content in a personalized manner -- and it's been done by plenty of people well before Amazon bothered to patent the idea. 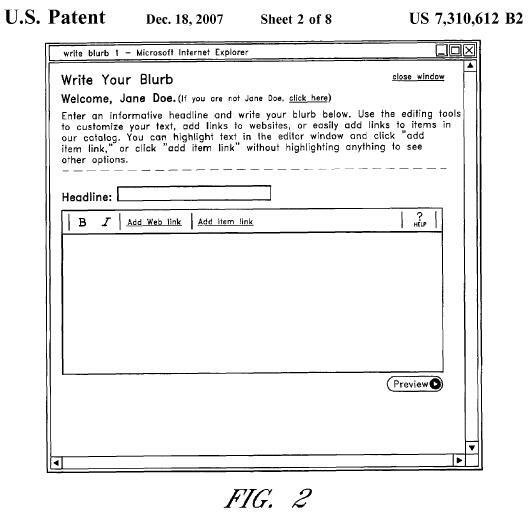 In the meantime, anyone else find it funny that Amazon has patented "blurbs" at about the same time that Google has patented "snippets"? Now wouldn't that make for an interesting patent infringement lawsuit? Google's patent appears to be about taking a document and coming up with an automated summary "snippet" that can be displayed with search results. Again, it seems like a stretch that this should be patentable, but the patent office clearly feels differently. So, let's see... if both blurbs and snippets are patented, what's next? Clips? Who wants to patent clips? Yahoo? Microsoft? eBay? Anyone?